Hello friends, I hope you all are fine and will be doing great. In today’s tutorial, we are gonna have a look at detailed Introduction to MFRC522. 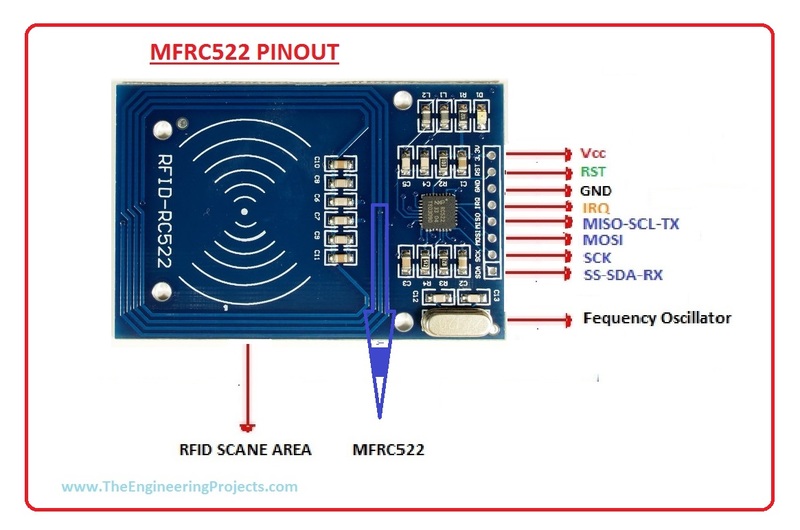 MFRC522 is basically a highly integrated read and write card chip applied to the 13.56 MHz contactless communication. It is a less costly, low voltage, and small-sized non-contact card chip. It is the best choice for intelligent instrument and portable handheld devices. The protocol on which it works is SPI. Let’s start a detailed introduction of MFRC522. MFRC522 module is a less costly, lower voltage, and small-sized noncontact card chip, it is the best choice for security instrument and portable devices. This sensor-based on advanced modulation and demodulation concept, this concepts uses in all types of contactless communication methods. MFRC522 also supports crypt-01 encryption algorithm to verify Mifare products. It supports Mifare series of high-speed non-contact communication, by using this series we can send and receive data up to 424 kbit/s. A transmitter of MFRC522 is able to drive reader and writer antenna, which designed to communicate with IEC 14443 A/MIFARE cards. It works with this card without any special circuit. MFRC522 supports MF1xxS20 and MF1xxS70 products. This version has An additional timer pre-scaler. It has more stability in rough conditions. PIN 01: SDA, this pin use for SPI protocol. PIN 02: SCK, this pin used for providing a clock. PIN 03: MOSI, this pin is used for master device to get out data and for the slave device to get in data. PIN 04: MISO, this pin is used for the slave device to get out data and for a master device to get in data. PIN 05: IRQ, this pin is for interrupt purpose. PIN 06: GND, this pin is used for ground. PIN 07: RST, this pin is used for reset-purpose. PIN 08: Vcc, at this supply voltages are applied. For better understanding let see a picture of PINOUT. These are some features of MFRC522. Its operating current and voltage are 13 to 26 mA/DC 3.3V. Its Idle operating current voltage is 10-13 mA/ DC 3.3V. Its sleep current is <80 uA. Its Peak current value is <30 mA. Its Operating frequency is 13.56 MHz. Its dimension is 40 mm×60 mm. Its Ambient operating temperature is – 20 to 80 degrees centigrade. Its Ambient storage temperature is – 40 to 85 degrees centigrade. Its Ambient relative humidity 5% is 95%. It has FIFO buffer handles 64 byte sending and receiving data. Let’s discuss the SPI Protocol on which it works. Serial peripheral interface (SPI) is supported to enable high-speed communication to the host. This interface can handle data speeds up to 10 Mbit/s. Communicating with a host, the MFRC522 acts as a slave, receiving data from the external host for register settings, sending and receiving data relevant for RF interface communication. 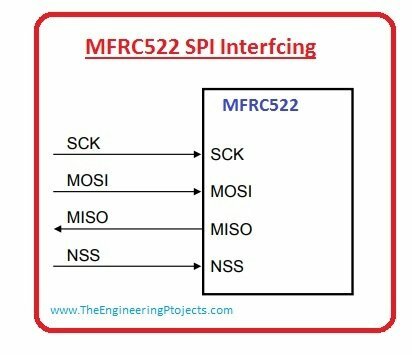 An interface with SPI enables high-speed serial communication between the microcontroller and an MFRC522. MFRC522 acts as a slave during SPI communication. SPI clock signal SCK must be generated by the master. Data communication from the master to the slave device uses the MOSI line. MISO line is used to send data from the MFRC522 to the master. Data on both MOSI and MISO lines are sent with the MSB first. For better understanding lets have a look at its circuit diagram. Let disuses some applications of MRFC522. These are some applications of MFRC522. MFRC522 is a highly integrated reader/writer IC for contactless communication. It can be used for security purposes in office, banks, and some buildings. It can be interfaced with Arduino for some industrial projects.